Last week I scored an antique dollhouse miniature that I've coveted for a long time, but I could never bring myself to pay its hefty asking prices. 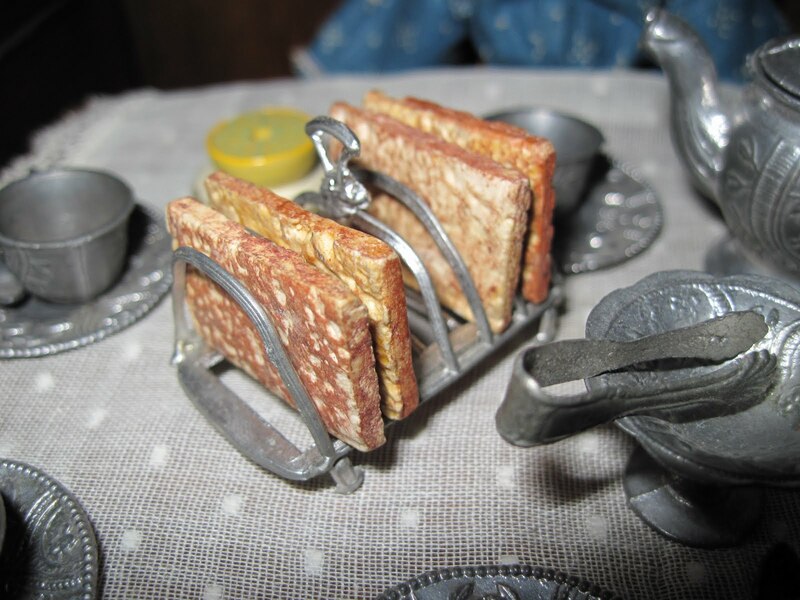 It's a tiny toast rack, complete with four slices of toast, made in Germany by Gerlach from 1915 through the 1920s. 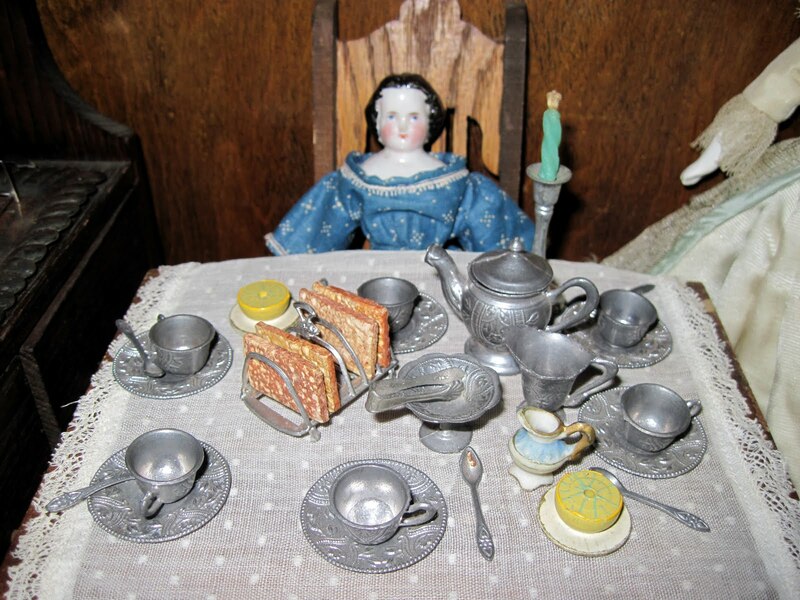 My 5 inch china doll has added the toast rack to her breakfast table. The rack is made of a soft metal and the toast is a composition-type material. It's incredibly fragile and very beautiful. It's an irony of miniature collecting that sometimes the smallest things have the highest prices. This tiny object, only an inch and a quarter tall, usually comes with a three-figure price tag! The only examples I've seen in the two years I've been looking were priced at $135 and $110, which are typical for this piece. 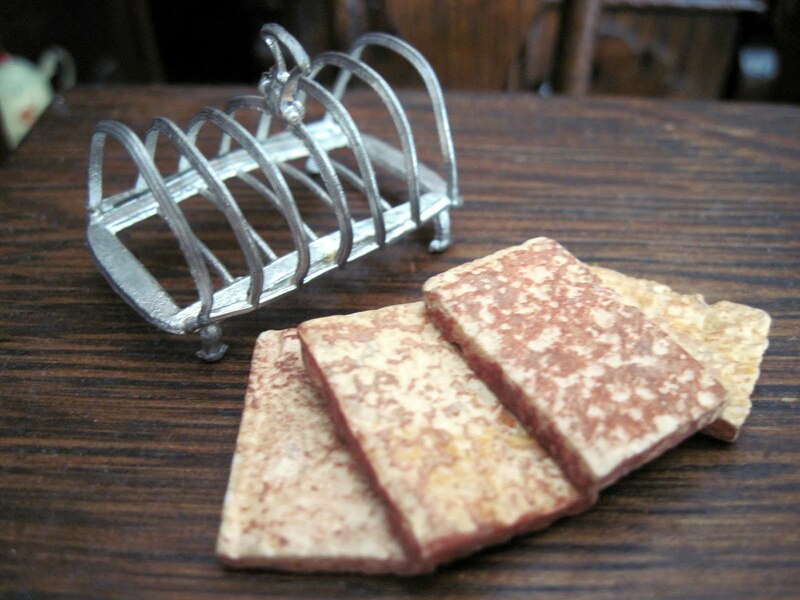 I resisted these offerings, firmly telling myself there was no way I was going to spend $135 on an inch tall toast rack, and am I ever glad I did, because the one I found last week was somehow unknowingly priced at only $14.99! Sometimes, the toy collecting gods smile upon us, and things like this happen...thank you, toy gods, thank you. Excellent find, and what a great price too! Good for you for holding out for that more realistic price. I'm smiling at your good fortune! Aren't the Toy Gods amazing!! !